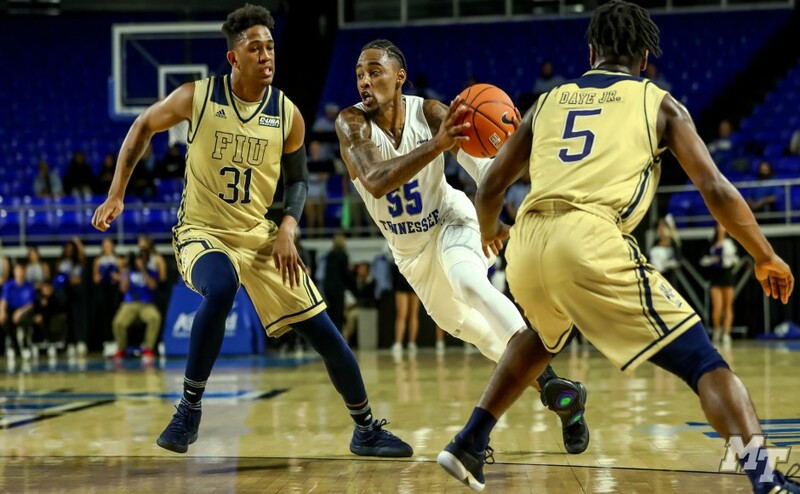 Middle Tennessee (5-2) took on South Alabama (3-5) at the Murphy Center on Saturday evening, just days after losing a heartbreaker to nationally acclaimed VCU. The Blue Raiders were able to pull out the 68-55 victory over the Jaguars, even after turning the ball over 19 times. The Blue Raiders came out shooting lights out, hitting their first four shots, all of which were from behind the arc. Two of the four shots were drilled by sophomore guard Giddy Potts, who finished 5-for-8 from three-point range for 17 points. Potts also grabbed 14 defensive rebounds to become the first Middle Tennessee guard to collect a double-double since Marcos Knight in 2013. South Alabama played in a 2-3 zone for the majority of Saturday’s contest against the Blue Raiders, which is what the team struggled with the most against VCU on Wednesday evening. 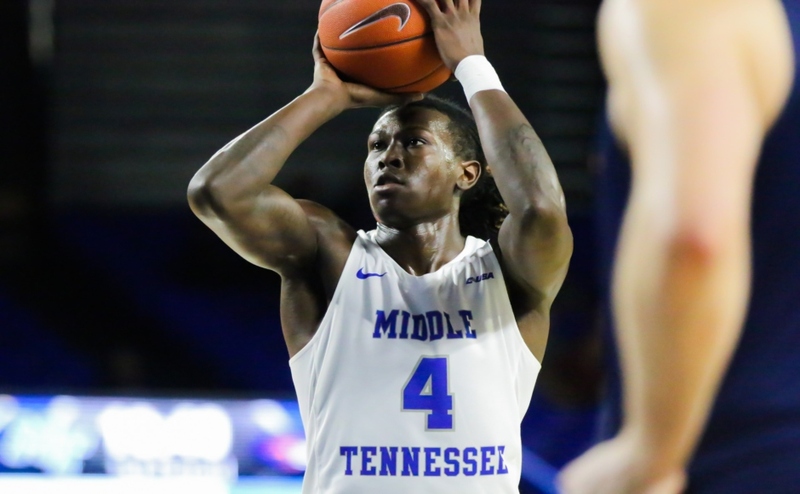 Middle Tennessee found success early swinging the ball around the top of the key, finding shooters open. 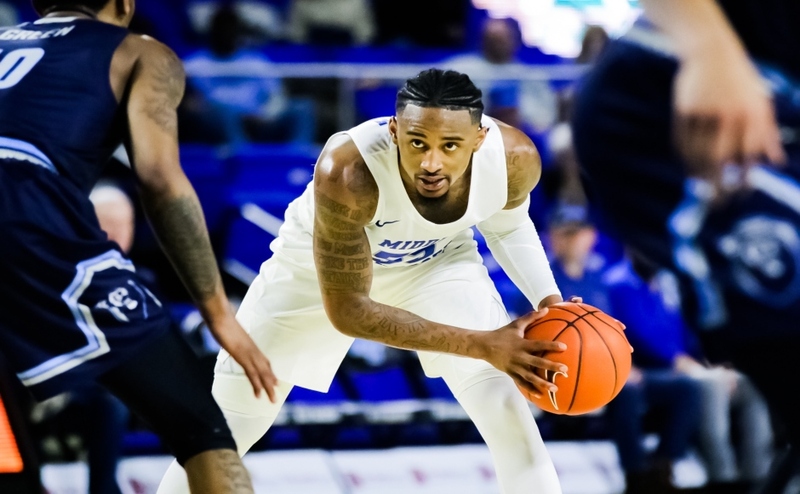 The Blue Raiders kept that methodology throughout much of the first half, but it led to 10 turnovers, which gave the Jaguars life after being out-shot and out-rebounded in the first half. South Alabama was able to telegraph almost every pass that Middle Tennessee made in the latter stages of the first half, which allowed them to end the half only down 31-29. The Blue Raiders struggled when multiple players were in foul trouble early, mainly Perrin Buford and Reggie Upshaw. Both players ended the first half with two fouls, so they were forced to sit out a large portion of the 1st half. Upshaw struggled to get in rhythm Saturday, finishing with just four points and four fouls. Quavius Copeland and Karl Gamble were two bench players who saw extended action due to foul trouble. Gamble came into the game only scoring one point and playing a total of 18 minutes on the season, but he finished with three points and five rebounds, along with one block in 14 minutes of action. “I’ll tell you the guy I really thought played good tonight was Karl Gamble. He’s had a good two, three days of practice, and I had to get him in the game. You’ll see his natural ability, he’s able block shots, and he’s quick off his feet. 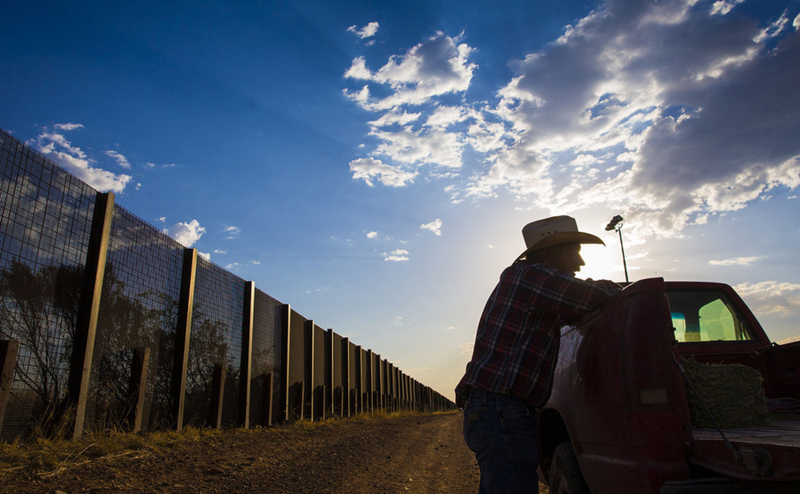 We’re gonna see him more,” Davis said. South Alabama came out hungry and inspired to start the second half, while the Blue Raiders came out sluggish and dazed. Middle Tennessee had two costly turnovers to start the half that would allow the Jaguars to have a huge momentum swing. The Blue Raiders were sticking to the same game plan of kicking the ball around the perimeter looking for an open shot, but South Alabama had made tremendous halftime adjustments to counteract this type of play. The Jaguars were aggressive in attempting to pick off passes made by Middle Tennessee. Their aggressiveness led to turnovers and disruption of the rhythm the Blue Raiders wanted to have. The Blue Raiders made some quick, mid-game adjustments to get big man Darnell Harris and Reggie Upshaw at the top of the key. Harris was able to battle for position and get some tough-fought buckets to fall to keep Middle Tennessee ahead in the game. Harris would finish with a game-high 20 points and a career-high four blocks. 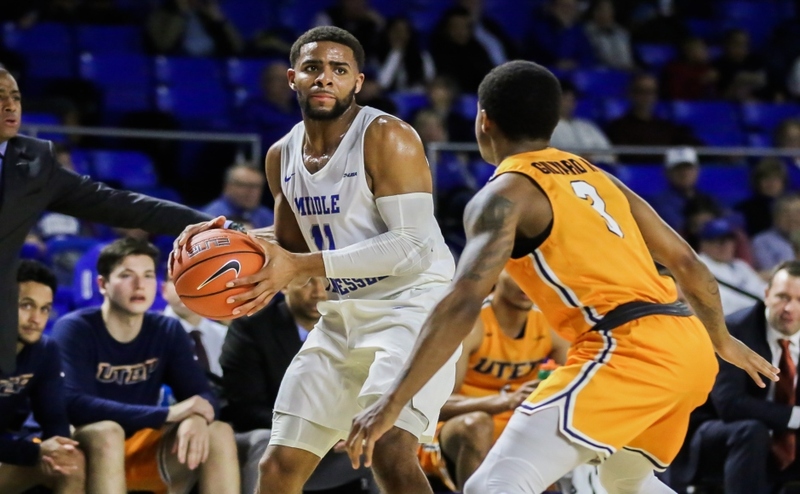 The Blue Raiders were able to gain momentum back midway through the second half, thanks to an 11-0 run, re-taking and extending the lead to 49-39 with just over nine minutes remaining in the game. The Blue Raiders defense was able to hold the Jaguars scoreless for almost six minutes, which would be the deciding factor in the game. Harris would drive the dagger through the Jaguars with 35 seconds left, burying a corner three after giving a nasty pump fake that left the defender airborne. The Blue Raiders take a week off in preparation for finals, and the team will be back in action on December 12th at Bridgestone Arena to take on the Auburn Tigers (4-1).